You are free to spend your time as you choose and where you choose. We respect your peace and privacy and we encourage your independence. However, we also believe in offering our residents the opportunity of occupying their time and enriching their lives through various different activities. To this end we employ an activities co-ordinator who is dedicated to providing our residents with a wide range of activities, experiences and opportunities. Our activities programme is very diverse and includes a wide range of opportunities for residents: from arts and crafts, to entertainers and guest speakers, games and quizzes, and even day trips. Full details are always on display. We have hairdressers and beauticians visit us on a regular basis and we even have a dedicated room to accommodate them. If you require any shopping then usually someone from the home will be able to shop for small personal items for you. Sometimes we arrange shopping trips for residents to various different locations and our residents will always be advised of such opportunities. Finally, we respect that our residents can come from a very wide range of faiths and cultures, and our home is open to all. We believe everyone should have the opportunity to practice their religion and follow their cultural traditions and we will do everything we can to support our residents with this. We employ a dedicated Activities Co-ordinator whose role is to schedule a continuous programme for activities, events and experiences for our residents. Click HERE to see a sample monthly programme. Most of our activities are delivered in the home. These include a wide range of craft activities, quizzes, entertainment and speakers. Throughout the year we hold a number of social events to which residents and their families are invited. We listen to your requirements and do what we can to support you in achieving these. From keeping up your hobby to having a haircut or following your religious traditions - we will help. 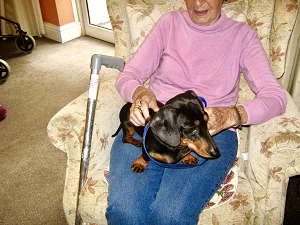 Variety is the spice of life and with that in mind we like to programme a wide range of activities for our residents. We aim for a diverse range, based upon resident's interests so they can spend their time engaged in something meaningful and enjoyable. Recently we have had fun making pasties, decorating plant pots and filling them with flowers to help get the garden ready for Spring. Alongside other arts and crafts projects we have regular chair based exercise and movement classes that are fully inclusive and participatory music sessions too. We also have professional entertainers visit us at Tamar House. To keep our minds as active as our bodies, there are weekly quizzes, word searches and memories afternoons as well. Our group activities and trips out provide a perfect opportunity for residents to chat and socialise. But for those that prefer peace and quiet we offer opportunities for one to one sessions with the activities coordinator or our volunteers, doing any activity the resident enjoys or simply chatting. We are always happy to take suggestions from our residents for any activities they'd like to do or places they'd like to go. It might be a hobby or past time that they haven't done for a while, something new they'd like to try or skill they'd like to learn. 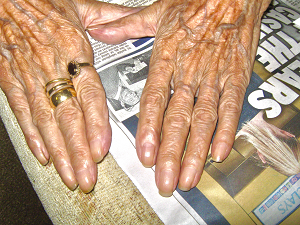 Our activities co-ordinator is also a dab-hand at doing manicures - the residents love them!